BILL HOLDEN : Blackburn, Lancashire. 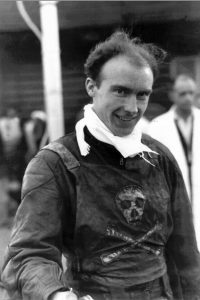 A talented rider who started his career at Southampton, Bill joined the Pirates midway through the 1951 season following the Hampshire club’s decision to withdraw from league racing. On his arrival he immediately formed an outstanding reserve partnership with Brian Crutcher that was to prove decisive in the club’s bid for league honours, before moving up into the team proper before the end of the season. His performances were recognised with the award of international caps against New Zealand and Sweden and he ended the season with an 8.26 average which helped the Pirates to win the Third Division championship. 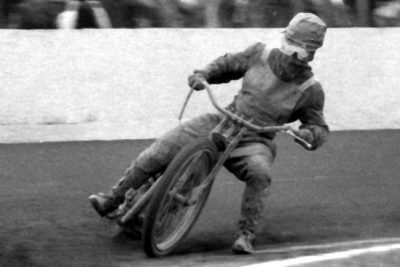 Bill’s attacking riding knew few boundaries and he continued to enjoy racing for Poole, where his consistent high scoring helped the Pirates to finish league runners-up in 1953 and 1954. He was also a member of the side which toured Sweden at the end of 1953. 1955 proved to be his best year in the Pirates colours, scoring 476 points from 48 matches to help Poole gain promotion to the First Division. Unfortunately he found racing in the top league tough going and requested a transfer away from the club, returning to Southampton midway through the 1956 campaign.. He rejoined the Pirates team in 1958 but struggled to stay competitive and retired after riding only six matches. Made 214 League and National Trophy appearances for the club and scored 1676 points.